A line cannot be broken, causing the line box to be wider than the block box. A block-level box is too wide for the containing block. This may happen when an element's 'width' property has a value that causes the generated block box to spill over sides of the containing block. An element's height exceeds an explicit height assigned to the containing block (i.e., the containing block's height is determined by the 'height' property, not by content height). A descendant box has negative margins, causing it to be positioned partly outside the box. The 'text-indent' property causes an inline box to hang off either the left or right edge of the block box. Whenever overflow occurs, the 'overflow' property specifies whether a box is clipped to its padding edge, and if so, whether a scrolling mechanism is provided to access any clipped out content. 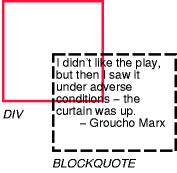 This value indicates that content is not clipped, i.e., it may be rendered outside the block box. This value indicates that the content is clipped and that no scrolling user interface should be provided to view the content outside the clipping region. This value indicates that the content is clipped and that if the user agent uses a scrolling mechanism that is visible on the screen (such as a scroll bar or a panner), that mechanism should be displayed for a box whether or not any of its content is clipped. This avoids any problem with scrollbars appearing and disappearing in a dynamic environment. When this value is specified and the target medium is 'print', overflowing content may be printed. The behavior of the 'auto' value is user agent-dependent, but should cause a scrolling mechanism to be provided for overflowing boxes. Even if 'overflow' is set to 'visible', content may be clipped to a UA's document window by the native operating environment. UAs must apply the 'overflow' property set on the root element to the viewport. When the root element is an HTML "HTML" element or an XHTML "html" element, and that element has an HTML "BODY" element or an XHTML "body" element as a child, user agents must instead apply the 'overflow' property from the first such child element to the viewport, if the value on the root element is 'visible'. The 'visible' value when used for the viewport must be interpreted as 'auto'. The element from which the value is propagated must have a used value for 'overflow' of 'visible'. In the case of a scrollbar being placed on an edge of the element's box, it should be inserted between the inner border edge and the outer padding edge. Any space taken up by the scrollbars should be taken out of (subtracted from the dimensions of) the containing block formed by the element with the scrollbars. A value of 'scroll' would tell UAs that support a visible scrolling mechanism to display one so that users could access the clipped content. Finally, consider this case where an absolutely positioned element is mixed with an overflow parent. In this example, the "scroller" element will not scroll the "satellite" element, because the latter's containing block is outside the element whose overflow is being clipped and scrolled. A clipping region defines what portion of an element's border box is visible. By default, the element is not clipped. However, the clipping region may be explicitly set with the 'clip' property. The element does not clip. In CSS 2.1, the only valid <shape> value is: rect(<top>, <right>, <bottom>, <left>) where <top> and <bottom> specify offsets from the top border edge of the box, and <right>, and <left> specify offsets from the left border edge of the box. Authors should separate offset values with commas. User agents must support separation with commas, but may also support separation without commas (but not a combination), because a previous revision of this specification was ambiguous in this respect. <top>, <right>, <bottom>, and <left> may either have a <length> value or 'auto'. Negative lengths are permitted. 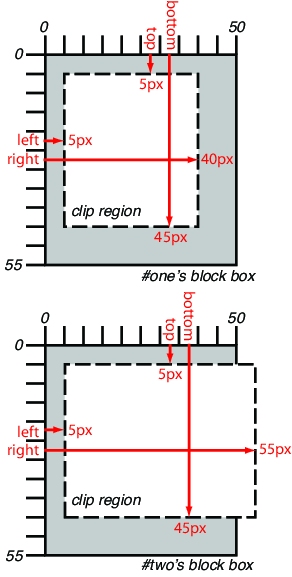 The value 'auto' means that a given edge of the clipping region will be the same as the edge of the element's generated border box (i.e., 'auto' means the same as '0' for <top> and <left>, the same as the used value of the height plus the sum of vertical padding and border widths for <bottom>, and the same as the used value of the width plus the sum of the horizontal padding and border widths for <right>, such that four 'auto' values result in the clipping region being the same as the element's border box). When coordinates are rounded to pixel coordinates, care should be taken that no pixels remain visible when <left> and <right> have the same value (or <top> and <bottom> have the same value), and conversely that no pixels within the element's border box remain hidden when these values are 'auto'. An element's clipping region clips out any aspect of the element (e.g., content, children, background, borders, text decoration, outline and visible scrolling mechanism — if any) that is outside the clipping region. Content that has been clipped does not cause overflow. The element's ancestors may also clip portions of their content (e.g., via their own 'clip' property and/or if their 'overflow' property is not 'visible'); what is rendered is the cumulative intersection. If the clipping region exceeds the bounds of the UA's document window, content may be clipped to that window by the native operating environment. Note. In CSS 2.1, all clipping regions are rectangular. We anticipate future extensions to permit non-rectangular clipping. Future updates may also reintroduce a syntax for offsetting shapes from each edge instead of offsetting from a point. The generated box is visible. The generated box is invisible (fully transparent, nothing is drawn), but still affects layout. Furthermore, descendants of the element will be visible if they have 'visibility: visible'. Please consult the section on dynamic row and column effects in tables. If used on elements other than rows, row groups, columns, or column groups, 'collapse' has the same meaning as 'hidden'. This property may be used in conjunction with scripts to create dynamic effects.